Where was the exact location and orientation of this marker? Provide a rationale. The historic marker was placed on the Motor Parkway right-of-way at Old Country Road. It is unknown whether the sign was on the north side (Mineola/Carle Place) or south side (Garden City) of Old Country Road. On the north side, the Motor Parkway was the border line between Mineola and Carle Place. The marker was likely on the north side since it did not appear in the below 1960 photo of the south side and the June 9, 1959 Newsday article placed the location in Mineola. Detectives Steve Lucas and Bruce Adams analyzed the shadows and concluded the marker was also on the north side! When was this historical marker dedicated? Who was at the dedication and why? Explorer Post 429, Boy Scouts of America of Plainview and Oyster Bay Town Supervisor John J. Burns. The scouts, including Vincent J. Bellafiore, participated in the dedication as part of their Motor Parkway hike from the Queens to Suffolk. They were hoping to earn the Histroic Trails Award. 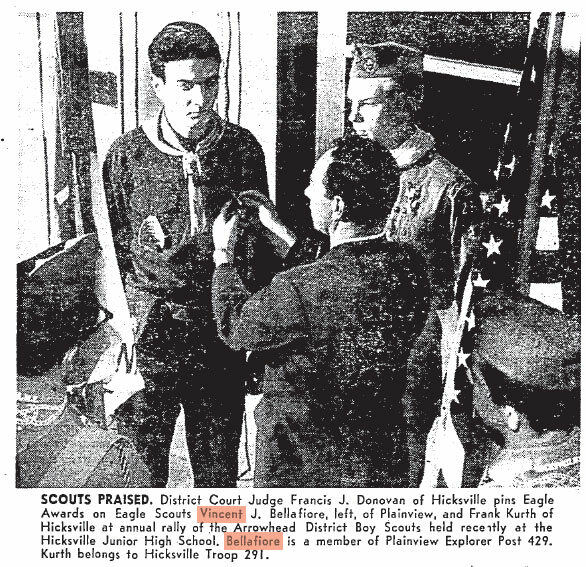 In June 1961, Bellafiore became an Eagle Scout. List the factual errors in the marker's copy. 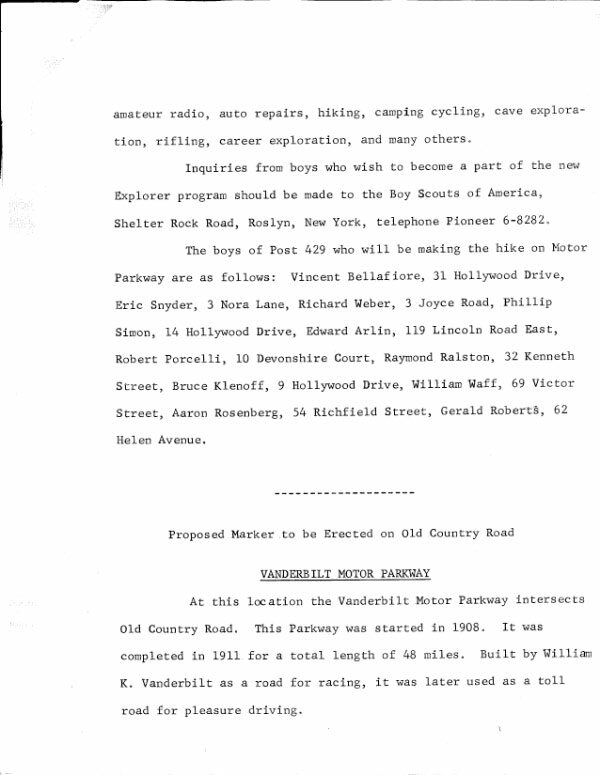 "Vanderbilt Motor Parkway" was always known as the Long Island Motor Parkway. "Interesected Old Country Road." The Motor Parkway went underneath Old Country Raod in this location. "Completed in 1911". The primary section of the Motor Parkway from Fresh Meadows to Lake Ronkonkoma was completed in 1926. "Total length of 48 miles." The actual official length of the Motor Parkway was 44.0 miles plus 2.1 miles of the Commack-Jericho Turnpike Extension. "Built by W.K. Vanderbilt". The Motor Parkway was built by W.K. Vanderbilt, Jr. and his business associates. Why was the marker taken down? Still unknown. Best guesses: The marker was stolen or taken down with the expansion of Old Country Road. Where in the world is this historical marker today? Still unknown. I have a call into the Nassau County Department of Public Works which placed the historic marker. Congrats to Ron Ridolph, Joseph Oesterle, Michael LaBarbera, Chuck Rudy, Gary Hammond, Tim Ivers, Steve Lucas, Greg O., Bruce Adams, and Frank Femenias for sharing information on the historic marker. Kudos to Joseph Oesterle, Michael LaBarbera, Chuck Rudy, Gary Hammond, Tim Ivers, Steve Lucas, Greg O., Bruce Adams and Frank Femenias for identifying inaccuracies inthe historical marker's copy. June 6, 1959 Dedicated Boys Scouts of America. Scout Vincent Bellafiore and Oyster Bay Town Supervisor John J. Burns on June 6, 1959. 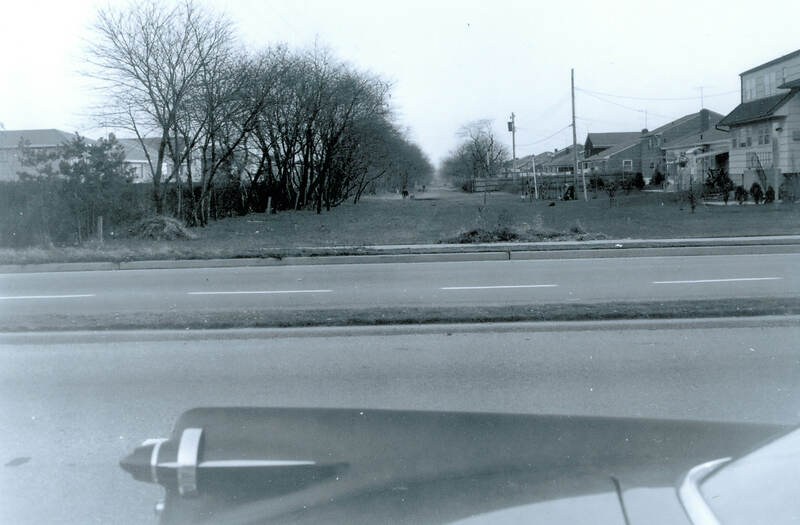 This 1960 photo shows the Motor Parkway right-of way at Old Country Road, looking south. The bridge was long gone, but several concrete posts remained along the fence line on the left. There was no sign of the historic marker. 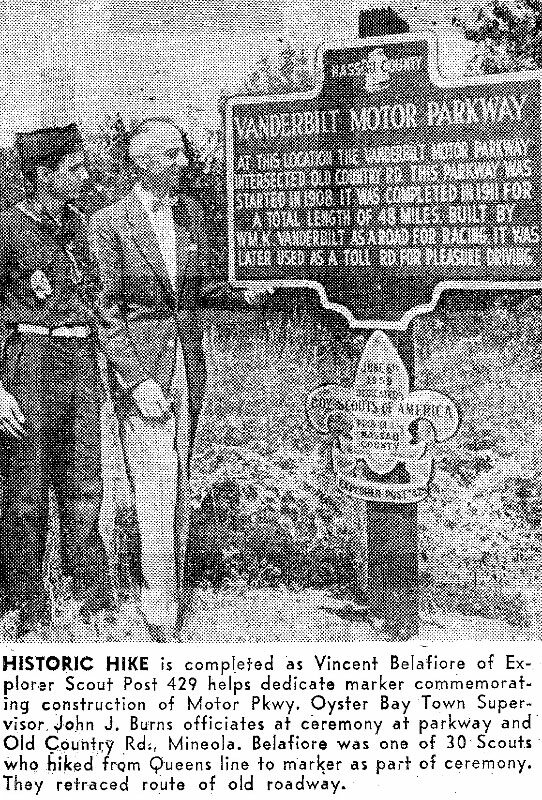 Historic Hike is completed as Vincent Belafiore of Explorer Scout Post 429 helps dedicate marker commemorating construction of Motor Parkway. Oyster Bay Town Supervisor John J. Burns officiates at ceremony at parkway and Old Country Road, Mineola. Belafiroer was one of 30 Scouts who hiked from Queens line to marker as part of the ceremony. They retraced route of old roadway. Press Release on the "historic hike" to the marker. Almost two years later, Vincent Bellafiore became an Eagle Scout. 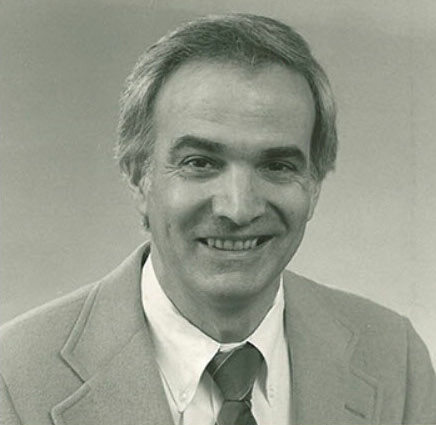 Vincent J. Bellafiore went on to become a prominent landscape architect. He "dedicated his life to teaching design from international and cross-cultural perspectives." 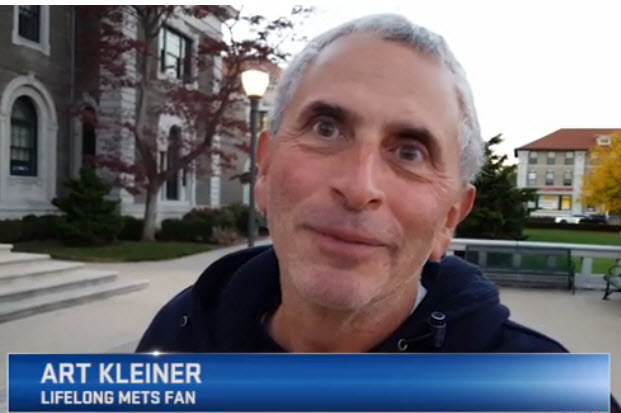 Art Kleiner: Here's a link to a recent mlb.com video and post taken at the Mets pep rally last Monday. Unfortunately the good times didn't continue (one reason I've kept my '69 and '86 mementos). Better luck next year. 1./ The location would be at the Mineola-Carle Place line. 2./ Removal probably due to highway improvement. It would have to be the Mineola, Carle Place, Garden City border, where the LIMP crossed under Old Country Rd. The marker clearly states it is Nassau County. The marker seems to be dated June 1959. The Parkway was not completed in 1911, but was expanded until at least 1926. As for where it is now? I look forward to finding out. Well its the sign at Old Country Road at the Old Motor Parkway, dedicated by the Boy Scouts in the 1950s, historical mistake is that it was not the complete 48 miles by 1911, the parkway made it to Queens by 1926. From what i heard the sign was stolen by hooligans and is missing to this day, I’m surprised that they did not replace it by now, but i pass it every morning on my way to work and can still see the old guideposts working their way down one after another toward the old underpass. I wonder if they destroyed the bridge or if they simply filled it in with dirt…that’s my question. Oh BTW it wasn’t the Vanderbilt Motor Parkway, it was called the Long Island Motor Parkway. Maybe the hooligans removed it because they were offended by the historical inaccuracies. As far as errors in the sign perhaps it being known as the Vanderbilt Motor Parkway and not the Long Island Motor Parkway? Since the Vanderbilt Cup race was run in 1908 on the LIMP I’d have to guess the start time at least of 1908 was incorrect, perhaps the finish date also. As far as why it was taken down, perhaps the historical facts were deemed incorrect and it was removed as inaccurate. But as always I’m just guessin’. .....a bit of the inaccuracy is noted here “the Motor Parkway was designed as a toll road as well as a race course, and contained 12 tollbooths along its 43-mile route.”....so 48 miles is a bit of an exaggeration. John J. Burns (1913-2000), a resident of Sea Cliff, served as Mayor of Sea Cliff, as NYS Assemblyman, and as Supervisor of the Town of Oyster Bay. The John J. Burns Park in Massapequa is named for him. This marker was dedicated on June 6th, 1959, and was not an “official” cast iron NYS style marker. 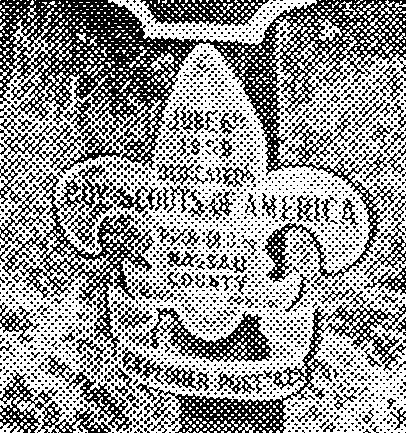 It probably was made of plywood, as was the Boy Scout logo sign below it, both attached to a square wood post. I would assume this marker no longer exists. Old Country Road a little west of Roosevelt Field where the LIMP used to intersect Old Country. There was a dedication ceremony there June 6, 1959. The gentleman with the bow tie was John Burns, Oyster Bay Town Supervisor. Boy Scout Troop 429 was celebrating an “Historic Trails” award. It was taken down when Old Country was widened. Where it is today is a mystery, but if it still exists, Howard will probably find it. The correct title should have been “THE LONG ISLAND MOTOR PARKWAY”. This marker was located on Old Country Road where the LIMP went under O.C.R., a few hundred feet west of Glen Cove Road. It was probably on the north side of Old Country Road because there appears to be a shadow behind the pole caused by the sun coming from the south. Also, there’s a photo taken in 1960 that appears with your bridge series taken from the south looking north that does not show the marker. If it was on the south side, it probably would have been visable in the photo. The marker was dedicated on June 6, 1959 by John Burns, then supervisor of the Town of Oyster Bay, and Vincent Belafiore of BSA Explorer Post 429, both of whom are in the photo. 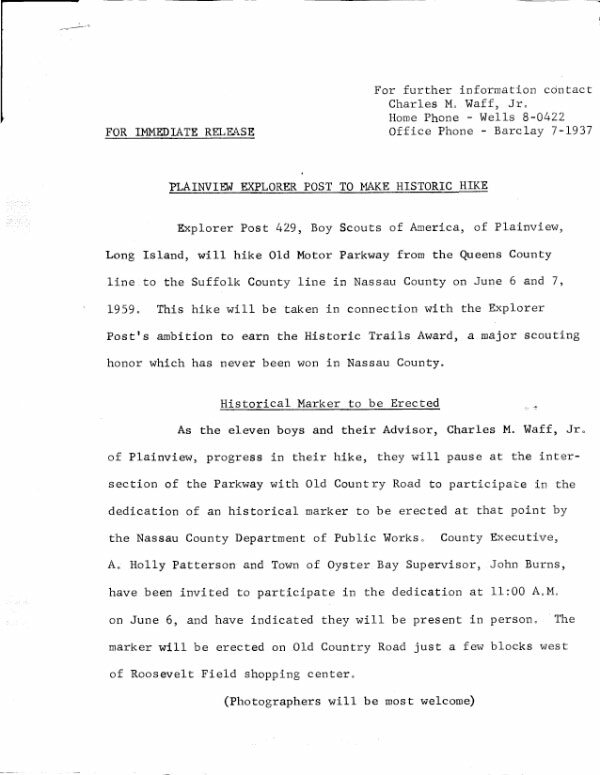 Belafiore and the other Boy Scouts in his post were attempting to earn the Historic Trails Award by hiking along the route of the LIMP in Nassau County. 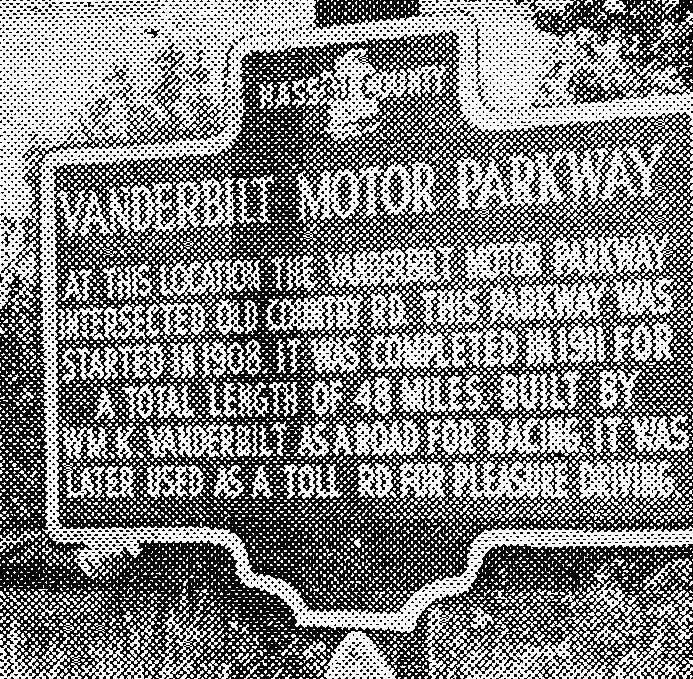 Among the errors on the marker are: the road was never called “Vanderbilt” Motor Parkway; the LIMP didn’t “intersect” Old Country Road, it went under it; it didn’t comprise 48 miles in 1911; it only approached that length by the mid to late 1920’s after several extensions. The marker was probably removed during the widening of Old Country Road sometime in the 1960’s and nobody seems to know where it is today. Where was the exact location and orientation of this marker? The Boy Scouts of America Explorer Post 429 as they took a break in their hike retracing the route of the Motor Parkway. List the factual errors in the marker’s copy. The marker uses an incorrect version of the Parkway’s name. June 6, 1959 per the date on the scout emblem on the north side of OCR based upon the shadow facing north and the sun is always to the south. LIMP crossed OCR at bridge near present Vanderbilt Drive / Russell Drive on north side of OCR and east of Russell Road on south side. 1946 Hagstrom’s Map indicated an Albertson Road at LIMP OCR crossing, which in now Russell Road. 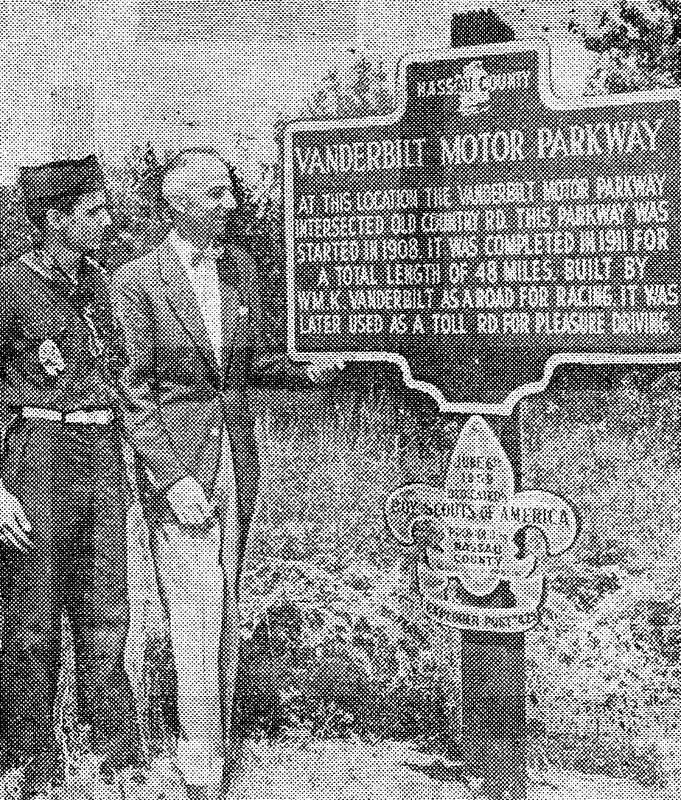 It is Long Island Motor Parkway not Vanderbilt Motor Parkway. LIMP crossed under, not intersected OCR. Parkway was completed 1929. The LIMP was 47.2 miles long plus 2.1 miles for Harned Road making it 49.3 miles of pavement. Could that be Robert Hughes with the sign? Is the marker in Howard’s Museum or The Garden City Chamber of Commerce building? June 6, 1959. Oyster Bay Town Supervisor John J. Burns and Boy Scout Vincent Belafiore of Explorer Post 429 dedicating the marker after earning the Historic Trails Scouting Award (first time achievement in Nassau County). On this day, Vincent and 29 other scouts hiked the Motor Parkway right-of-way from the Queens county line, Lake Success to the marker at Old Country Road, Mineola (6.7mi). Motor Parkway passed under Old Country Rd. at this location. Guessing the marker was placed on Old Country Road’s south sidewalk. The photo is facing south where heavy brush behind filled the former highway bridge. On the north, a housing complex was erected. Parkway length should be closer to 45.2mi. Most likely marker was removed for the widening of Old Country Road. This marker may not have stood for very long as the roadway was already widened by 1966. Village of Mineola Dept. of Public Works, 155 Washington Av. Village of Garden City Dept. of Public Works, 2 Cherry Valley Av. Village of Westbury Dept. of Public Works, 500 Dover St. Wish I was able to answer this one,but I didn’t have any access to the Internet and anyhow I wouldn’t of had time anyway,this is the only chance that I have,until I get back to Virginia sometime on Thursday.I can say one thing about this mystery is that the 4th closeup picture I think is a 1958 or 59 Chysler Imperial. Richard,I suggest contacting the Town of Hempstead historian.